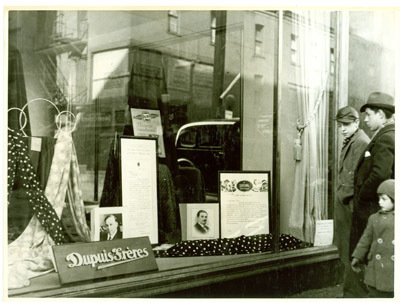 The Archives Department has designed a fascinating virtual exhibition entitled "Dupuis Frères, le magasin du peuple 1868-1978", devoted to the famous department store and its times. The exhibition offers a broad panorama of Quebec’s economic and social history as it brings to life a legendary store that many Quebeckers still remember fondly. It draws on the extensive Dupuis Frères archival fonds (some 20 linear metres of documents), entrusted to HEC Montréal after the company went bankrupt in 1978. The exhibition looks at different aspects of the company’s life, from its organizational culture and human resources management to marketing and fashion. Virtual visitors will find all kinds of fascinating tidbits, including internal memos and copies of the employee newsletter, Duprex. Despite their somewhat outdated tone, they sometimes reveal challenges and concerns still facing businesses today. There are also many mail-order catalogues to flip through, a shopping option the Montréal department store added in 1921. The site contains plenty of photos and documents, along with video clips featuring Dupuis family members and guest experts, including fashion designer Jean-Claude Poitras. The exhibition was produced with financial assistance from Library and Archives Canada, Bibliothèque et Archives nationales du Québec and the Canadian Council of Archives. Julie Lemieux, Director of the HEC Montréal Archives Department, expressed her thanks to her entire team for their valuable assistance, and to the School’s Audiovisual Services Department and Electronic Communications Department.